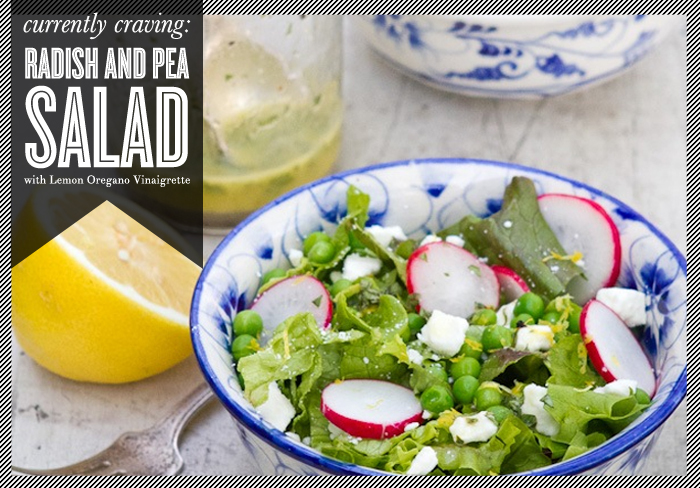 My mouth is watering just looking at this radish and pea salad with lemon oregano vinaigrette. Fresh, light, and the perfect dish for spring. It always baffles me when I learn that my nieces and nephews (and my mother-in-law!) are not fans of these sweet little morsels. I mean, really, why are people hating on the humble pea? On that note, I really hope one day we will all live in world peas. Perhaps if we all become hip-peas it could happen? Peas, love, and all that other kumbaya stuff. Ok....I'll stop now. I am totally embarrassing myself with the elementary-level puns I somehow can't resist telling. BUT I bet all that laughing worked up your appetite, didn't it? Now go make this salad. Update: I stand corrected!! Just got an email from my mother-in-law proclaiming, "I LOVE PEAS, LOVE PEAS...LOVE PEA SOUP, COLD PEAS, HOT PEAS." Apparently I confused her for someone else. So, dear readers, if you leave with any insights today, it should be that my m-i-l is one of the loveliest pea-eating machines on the planet.